When you wish to make a specific Option or Size (SKU) unavailable for your Buyers to order, you have 2 options: Disable Selling or Set Inactive. For more information on the difference between Active and Inactive products, see this article. 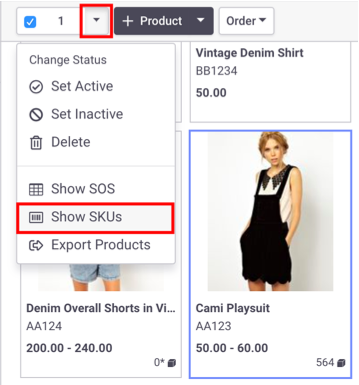 Select a Product, click the status dropdown, and select "Show SKUs"
In the panel that appears, check the boxes for the SKUs you wish to edit and then select the desired option from the Status dropdown menu. When individual Sizes are modified, in both cases they will appear as dark grey cells on the Buyer's side and prevent them from entering any quantity values. A Selling-Disabled cell will appear in light grey and still allow the Seller to edit it. An Inactive cell will appear in darker grey and prevent the Seller from editing. When all the sizes of the same Option are set to Disable Selling or Inactive, the entire Option row will be hidden from the Buyer. In this example, the 2nd Option has been set to Disable Selling while the 3rd Option has been set to Inactive. On the Buyer side, you can see that there's only one visible Option left for the Buyer to order. On the Seller side, the Inactive Option is hidden from the Order Form but the Selling-Disabled Option is shown in light grey and still editable. To enable selling, follow the same steps to change the product status and select "Enable Selling" or "Set Active."